Fiberitis: I've Got A Peaceful Palm!!! It's a glove. Knitted using Brownsheep NatureSpun worsted on size 4 dpn's. It's been a joy to knit this based on the Progressive Gloves article from Knits (Winter 2003). I have XL hands and it's nice to be able to have gloves that fit. I should have done this a long time ago. The bag is the felted KISS purse minus the handles. I must find my grommet tool, because I just absolutely refuse to buy another unless Xmas catches up with me. Pretty glove! 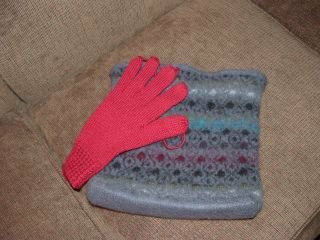 Mittens are on my to do next list....which is a long list, btw! Hope you are doing well, Beverly.